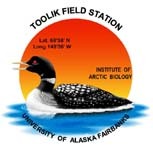 » Plant leaf area in Arctic LTER tussock tundra experimental small mammal exclosures. Exclosure plots were setup in July 1996 on extra 5 x 20 meters plots within the four block design of the 1989 LTER acidic tussock experimental plots. On each plot a 5x10 meter section was fenced with large mesh (4-inch square mesh) and within this fence a 5x5-meter plot was fenced with a small mesh (1/2-inch square mesh). In each block two fenced plots were setup: a plot with no fertilizer and a plot with annual fertilization (NP) treatments of 10 g/m2 Nitrogen (as NH4NO3) and 5 g/m2 Phosphorous (as triple superphosphate). In this biomass harvest only the control unfenced, control small mesh, NP unfenced, and NP small mesh treatments were sampled. In addition controls in a non-acidic moist tussock site with a 3-block design were sampled. SAMPLING TECHNIQUES Biomass quadrats, size 20x20 cm, were taken from Toolik tussock site. Five quadrats were taken from each of four blocks. All aboveground biomass was clipped in 20x20 cm quadrats. Five quadrats were randomly located along line transects in each of four replicate blocks in each treatment. Aboveground biomass is considered "within" the quadrat if it is associated with a meristem that is within the quadrat. Quadrats were sorted within 24 hours into species and then into tissue type. Depending on the harvest, tissue types can be broad categories, i.e. above and below, or more detailed, i.e. inflorescences, new growth, old growth, etc. Leaf area was measured with a LiCor LI-3000A area meter. Leaf areas for graminoids, deciduous, and forbs were measured immediately after plucking and before drying. Leaf areas for Evergreen species (except Ledum) were measured after drying for 2-4 days. Leaf areas for Ledum were measured after final dry weights were done. Cassiope leaf areas were measured on the unseparated leaves and stems. The samples were dried at 60 degrees C in a drying oven and after several days weighed to nearest milligram. Samples are then returned to Woods Hole for nutrient mples were dried at 60 degrees C in a drying oven and after several days weighed to nearest milligram. Samples are then returned to Woods Hole for nutrient analysis. Details are given in Shaver and Chapin (Ecological Monographs, 61(1), 1991, pg. 1.). Note Only 3 blocks were sampled from the fertilized treatments. Cassiope was not separated into leaves and stems. Weights for Cassiope were recorded as leaf weights or as stem weights. No leaf area was measured on Cassiope Calculations: Units; Tissue mass data are expressed in g/quadrat (400 cm2). Multiply by 25 to get g/m2. Leaf blade area are in cm2/quadrat. Multiply by .0025 to get m2 leaf/m2 ground. Definition: Species Note: Only the major species were weighed separately. All other species were lumped under the "Other" category. The category "Comments has notes on the species lumped.